I thought I might get into dragon breeding. Unfortunately it turns out it's a bit like hatching Sea-Monkeys; not an entirely advantageous venture. It's a lot of hard work and time looking after dragon eggs! Thank goodness I have the perfect person to send this one too. I'm sure she'll take good care of it. I love this, it is so beautiful and intriguing! I remember sea monkeys! And i always tried so hard to hatch them as a kid too! I haven't thought about them in so long. Thanks for sharing! So enchanting Nichola . . . but best left to others to care for indeed!! Does it come equipped with an "in-case-of-hatching" disclaimer? 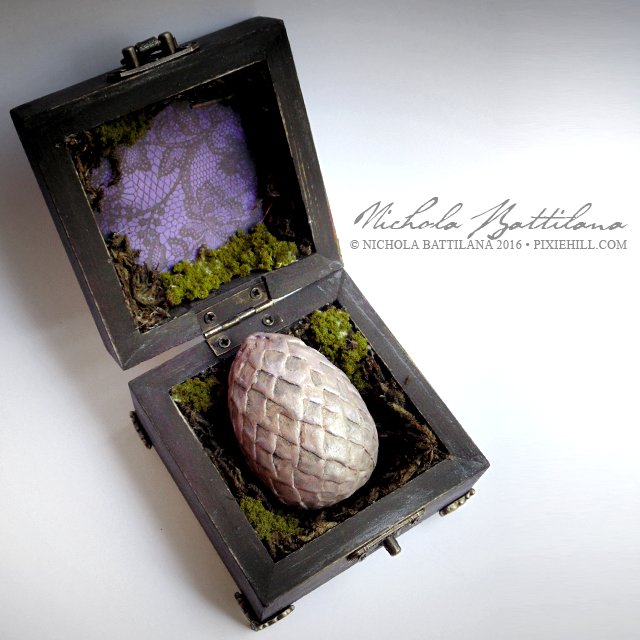 Keep the egg for I fear dragons. I'll take the box. Cool. That is entirely too brilliant by half. Are you going to sell them?! Can a person perhaps special order one? Hagrid swore by a hot fire, chicken blood and brandy, I think. Tricky business. You are so amazing! No dragon eggs for me,too much work! I'll see what I can do. It really was a massive pain in the bum for a few days! I take it, you're sending it none other than the Mother of Dragons, right?